Why Even Radiologists Can Miss A Gorilla Hiding In Plain Sight : Shots - Health News An attention researcher wanted to find out how radiologists would fare in a version of the famous Invisible Gorilla study. He found that 83 percent of the radiologists failed to spot an image of a gorilla on slides they were told to inspect for cancer. It's just one example of how, when people are asked to perform a challenging task, their attention can narrow and blocks things out. 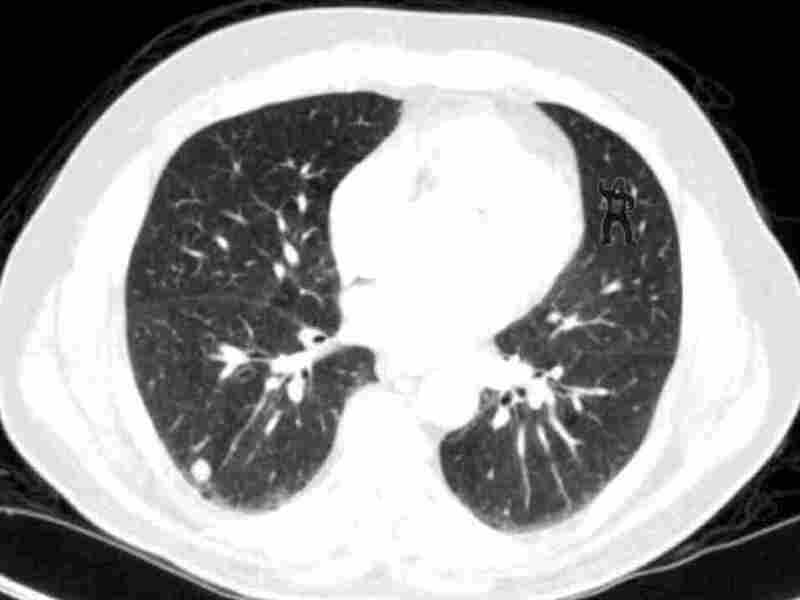 Notice anything unusual about this lung scan? Harvard researchers found that 83 percent of radiologists didn't notice the gorilla in the top right portion of this image. This story begins with a group of people who are expert at looking: the professional searchers known as radiologists. "If you watch radiologists do what they do, [you're] absolutely convinced that they are like superhuman," says Trafton Drew, an attention researcher at Harvard Medical School. About three years ago, Drew started visiting the dark, cavelike "reading rooms" where radiologists do their work. For hours he would stand watching them, in awe that they could so easily see in the images before them things that to Drew were simply invisible. "These tiny little nodules that I can't even see when people point to them — they're just in a different world when it comes to finding this very, very hard-to-find thing," Drew says. In the Invisible Gorilla study, subjects have to count how many times the people in white shirts pass the basketball. By focusing their attention on the ball, they tend to not notice when a guy in a gorilla suit shows up. But radiologists still sometimes fail to see important things, and Drew wanted to understand more. Because of his line of work, he was naturally familiar with one of the most famous studies in the field of attention research, the Invisible Gorilla study. In that groundbreaking study, research subjects are shown a video of two teams of kids — one team wears white; the other wears black — passing two basketballs back and forth between players as they dodge and weave around each other. Before it begins, viewers are told their responsibility is to do one thing and one thing only: count how many times the players wearing white pass the ball to each other. This task isn't easy. Because the players are constantly moving around, viewers really have to concentrate to count the throws. Then, about a half-minute into the video, a large man in a gorilla suit walks on screen, directly to the middle of the circle of kids. He stops momentarily in the center of the circle, looks straight ahead, beats his chest, and then casually strolls off the screen. The kids keep playing, and then the video ends and a series of questions appear, including: "Did you see the gorilla?" "Sounds ridiculous, right?" says Drew. "There's a gorilla on the screen — of course you're going to see it! But 50 percent of people miss the gorilla." This is because when you ask someone to perform a challenging task, without realizing it, their attention narrows and blocks out other things. So, often, they literally can't see even a huge, hairy gorilla that appears directly in front of them. That effect is called "inattentional blindness" — which brings us back to the expert lookers, the radiologists. Drew wondered if somehow being so well-trained in searching would make them immune to missing large, hairy gorillas. "You might expect that because they're experts, they would notice if something unusual was there," he says. He took a picture of a man in a gorilla suit shaking his fist, and he superimposed that image on a series of slides that radiologists typically look at when they're searching for cancer. He then asked a bunch of radiologists to review the slides of lungs for cancerous nodules. He wanted to see if they would notice a gorilla the size of a matchbook glaring angrily at them from inside the slide. But they didn't: 83 percent of the radiologists missed it, Drew says. This wasn't because the eyes of the radiologists didn't happen to fall on the large, angry gorilla. Instead, the problem was in the way their brains had framed what they were doing. They were looking for cancer nodules, not gorillas. "They look right at it, but because they're not looking for a gorilla, they don't see that it's a gorilla," Drew says. In other words, what we're thinking about — what we're focused on — filters the world around us so aggressively that it literally shapes what we see. So, Drew says, we need to think carefully about the instructions we give to professional searchers like radiologists or people looking for terrorist activity, because what we tell them to look for will in part determine what they see and don't see. Drew and his co-author Jeremy Wolfe are doing more studies, looking at how to help radiologists see both visually and cognitively the things that hide, sometimes in plain sight.